Steven Troughton-Smith today discovered a brief video on Apple's servers that appears to show Xcode 10 running on macOS 10.14. The well-known developer says he found the 30-second clip buried within an API on the backend of the Mac App Store. He shared a direct link to the video, embedded below, with 9to5Mac's Guilherme Rambo. Given the video originates from Apple's servers, and is for its own Xcode development tool, everything shown is very likely real. 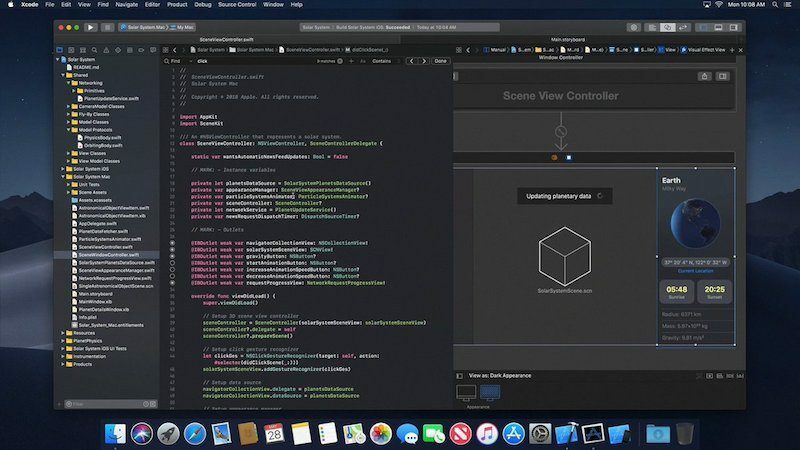 Xcode 10 has a new dark interface, while the Trash icon in the dock is also darker, suggesting that macOS 10.14 may feature a systemwide dark mode, including in apps. On macOS 10.13, there is a partial dark mode, but only for the dock and top menu bar. There is an Apple News icon in the dock, suggesting that it will be expanding to the Mac with a desktop app. The desktop background could be a picture of the Mojave Desert in California during the night, hinting at a macOS Mojave name for the next version. MacRumors recently noted that Mojave could be Apple's top choice based on the company's recent trademark activity. The video itself also likely confirms rumors that the Mac App Store will be redesigned on macOS 10.14 to more closely resemble the App Store on iOS 11, including the addition of preview videos like this one for apps. The leak comes just two days before Apple's annual Worldwide Developers Conference, where the company is expected to preview macOS 10.14 alongside iOS 12, watchOS 5, and tvOS 12. WWDC opens with a keynote on Monday at 10:00 a.m. Pacific Time at the McEnery Convention Center in San Jose, California. MacRumors will be in attendance at the keynote, with live coverage of the event beginning shortly after 8:00 a.m. Pacific Time. Stay tuned to MacRumors.com and our @MacRumorsLive account on Twitter. Finally a leak on macOS! Been too long. I like it. An actual leak! Dark mode is certainly what the younger crowd likes. And tiny fonts. "You darn kids, get outta my yard!" My excitement for WWDC has reached my a new level. Guessing Tim’s memo about leaks was quite effective. I LOVE dark mode, and my eyes do too!